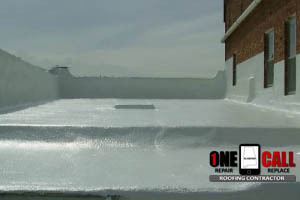 In Birmingham, spray foam roofing for flat or low-sloped roofs is becoming very popular. With the ability to insulate your roof against extreme temperatures it can dramatically reduce your energy costs. way to seal and protect your commercial roof? Call us at: (205) 370-9450 for a free estimate. Whether you have a tar & gravel, TPO, metal or built-up roof, we can quickly replace it with an energy efficient foam roof. Before you hire a contractor to apply this type of insulated roof, make sure they are reputable, licensed and insured. At One Call Roofing, we have a ton of independent customer reviews that support our A+ ratings with the BBB and Angie’s List. Always get a free written estimate and be sure it includes information about them that you can verify. Lower Heating and Cooling Costs – Polyurethane foam insulates your building from extreme temperatures by sealing in climate controlled air and reflecting heat from the sun’s rays. Lightweight Roofing – The ability for your roof to protect your building from the elements is only as good as the strength of your roofing structure. A Foam roof is tough and weighs less than any other material. Seamless Waterproof Roof – Once the SPF or (spray polyurethane foam) has been installed, it receives a special rubbery coating that completely seals the entire roof. No seam roofing equals less opportunity to leak. How Much Does A Foam Roof Cost? While the cost of a spray foam roof may be a little more than it would be for traditional roofing, the return on investment or ROI, offsets the increase in price very quickly. 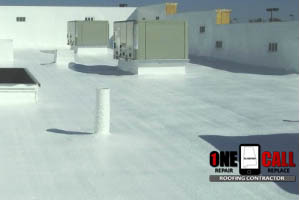 As we spoke about earlier, foam and the roof coatings applied to it can save you a lot of money on your utility bills. When you receive a free written estimate, spray foam roofing cost is broken down into materials and labor. 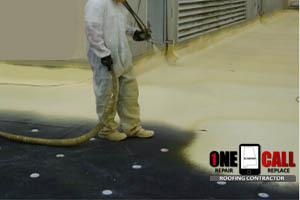 Materials are not just limited to the foam and the elastomeric roof coating it gets, but also materials needed to repair and prepare the old surface for the installation. Same goes for the time and labor. We are a foam roof contractor serving Birmingham, Hoover, Homewood, Trussville and Alabaster.